Most couples describe their wedding day as like a whirlwind – those special moments fly passed. That is why video is so popular – because it captures those very special moments that you may have missed in the charged emotions of your special day. Your big day is unique to you. So it needs a very special approach. It starts with a discussion about what you want from your video. We listen carefully and ensure that all angles are covered to achieve the perfect outcome. We take great pride in putting you at ease in front of a camera and make sure that we do not detract from your special day or get in the way of your guests, all desperate to get their own special photos of the happy couple. Every little detail is considered as we plan the shooting schedule so that we capture all those memorable moments that you will treasure forever. The only thing that matters to us is producing high quality wedding videos. We would love the opportunity of creating one for you or your family. So why not give us a call for a chat or have a look at our prices and ask for a bespoke quote? The quality of modern videography ensures that you will have a lasting, high-resolution visual memory of your special day. It captures all those special moments throughout your day, from morning preparations, through the ceremony, to the reception and those priceless speeches – then your first dance. It’s like your own mini feature film. Video collects expressions, smiles, laughter and those little special asides. It can be shared so easily on social media and made available to friends and relatives. Today, choosing your videographer is as standard as choosing your reception venue, caterers, honeymoon venue and wedding dress. And our careful editing service will ensure that we make the most of the footage from your special day. We are an award-winning dynamic and contemporary videography company based just outside Peterborough in Cambridgeshire. But such is our growing reputation that we are commissioned to cover weddings across southern England although the majority of our work is within a 30-mile radius of Peterborough. We pride ourselves on our ability to put couples at ease on their big day so they can enjoy every moment and we can capture them on film to be enjoyed afterwards. We use the very latest camera technology to ensure great, high definition images and crisp sound and music. Why choose Ellen Jackson Videography? 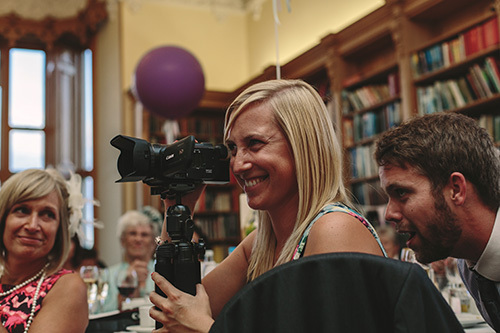 With many weddings under our belt, Ellen Jackson Videography is highly experienced in offering an efficient but discreet wedding video service across Cambridgeshire and beyond. We will meet up with you to chat through your ideas and to ensure we truly understand your vision for your big day. On the day itself we will capture all those precious moments to create a record of your special day, which you will enjoy for many years to come. ‘Most Popular UK Cinematographer’ in the 2016 Wedding Industry Expert Awards. Check out the quality of our work here. We would love the opportunity of creating one for you or your family. So why not give us a call for a chat or a quote.